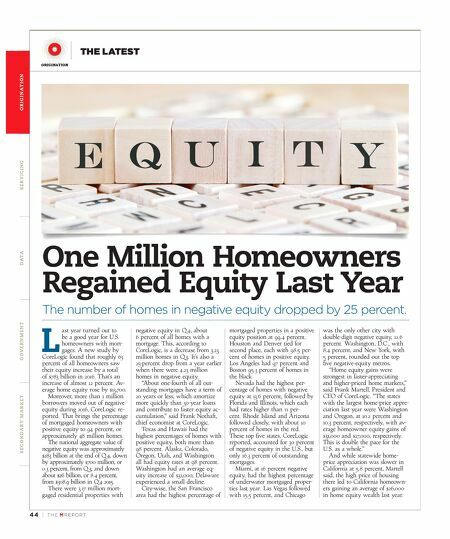 44 | TH E M R EP O RT O R I G I NAT I O N S E R V I C I N G DATA G O V E R N M E N T S E C O N DA R Y M A R K E T ORIGINATION THE LATEST One Million Homeowners Regained Equity Last Year The number of homes in negative equity dropped by 25 percent. L ast year turned out to be a good year for U.S. homeowners with mort- gages. A new study by CoreLogic found that roughly 63 percent of all homeowners saw their equity increase by a total of $783 billion in 2016. That's an increase of almost 12 percent. Av - erage home equity rose by $13,700. Moreover, more than 1 million borrowers moved out of negative equity during 2016, CoreLogic re - ported. That brings the percentage of mortgaged homeowners with positive equity to 94 percent, or approximately 48 million homes. The national aggregate value of negative equity was approximately $283 billion at the end of Q 4, down by approximately $700 million, or 0.3 percent, from Q 3; and down about $26 billion, or 8.4 percent, from $308.9 billion in Q 4 2015. There were 3.17 million mort - gaged residential properties with negative equity in Q 4, about 6 percent of all homes with a mortgage. This, according to CoreLogic, is a decrease from 3.23 million homes in Q 3. It's also a 25-percent drop from a year earlier when there were 4.23 million homes in negative equity. 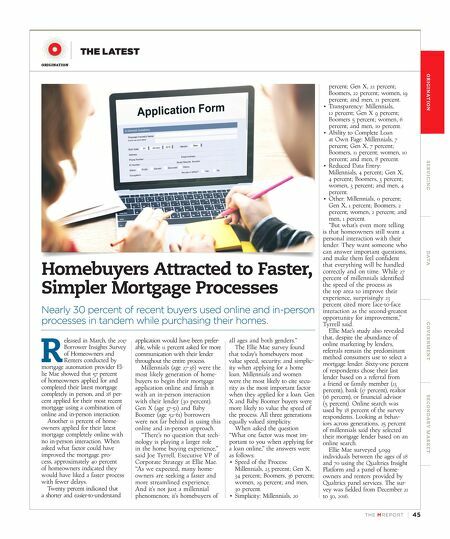 "About one-fourth of all out - standing mortgages have a term of 20 years or less, which amortize more quickly than 30-year loans and contribute to faster equity ac - cumulation," said Frank Nothaft, chief economist at CoreLogic. Texas and Hawaii had the highest percentages of homes with positive equity, both more than 98 percent. Alaska, Colorado, Oregon, Utah, and Washington all had equity rates at 98 percent. Washington had an average eq - uity increase of $31,000; Delaware experienced a small decline. City-wise, the San Francisco area had the highest percentage of mortgaged properties in a positive equity position at 99.4 percent. Houston and Denver tied for second place, each with 98.5 per - cent of homes in positive equity. Los Angeles had 97 percent and Boston 95.3 percent of homes in the black. Nevada had the highest per - centage of homes with negative equity at 13.6 percent, followed by Florida and Illinois, which each had rates higher than 11 per - cent. Rhode Island and Arizona followed closely, with about 10 percent of homes in the red. These top five states, CoreLogic reported, accounted for 30 percent of negative equity in the U.S., but only 16.3 percent of outstanding mortgages. Miami, at 16 percent negative equity, had the highest percentage of underwater mortgaged proper - ties last year. Las Vegas followed with 15.5 percent, and Chicago was the only other city with double-digit negative equity, 12.6 percent. Washington, D.C., with 8.4 percent, and New York, with 5 percent, rounded out the top five negative-equity metros. "Home equity gains were strongest in faster-appreciating and higher-priced home markets," said Frank Martell, President and CEO of CoreLogic. "The states with the largest home-price appre - ciation last year were Washington and Oregon, at 10.2 percent and 10.3 percent, respectively, with av- erage homeowner equity gains of $31,000 and $27,000, respectively. This is double the pace for the U.S. as a whole." And while statewide home- price appreciation was slower in California at 5.8 percent, Martell said, the high price of housing there led to California homeown - ers gaining an average of $26,000 in home equity wealth last year.